West Texas Intermediate (WTI) crude oil prices sank below $28.20 a barrel this morning – making the oil in the barrel more than three times cheaper than the actual barrel holding it. According to packing materials distributor Uline, a 55-gallon steel drum barrel commonly used for transporting oil costs $99 before tax. That's three times more expensive than the price of WTI futures for March delivery today (Thursday). That's just one of the many surprising items more expensive than a barrel of WTI crude oil right now. A barrel of WTI crude oil is cheaper than… seven cups of Starbucks coffee. One venti-sized Caffe Latte from Starbucks Corp. (Nasdaq: SBUX) costs $4.15 before tax. You can buy 6.8 cups of these 20-ounce coffees for a total of $29.05 – roughly 3% more than the current WTI crude oil price right now. A barrel of WTI crude oil is cheaper than… two large Meat Lover's pizzas from Pizza Hut. The largest pizza chain in the world currently offers large Meat Lover's pan pizzas for $15.50 each before tax. Two of these specialty pies cost 10% more than a barrel of oil in the United States today. A barrel of WTI crude oil is cheaper than… a quarter-keg of beer. The average price to fill up a quarter-barrel (roughly 7.75 gallons) keg with Budweiser beer comes out to $67.50. That's more than twice the cost of 55 gallons of West Texas Intermediate crude. Drink up. 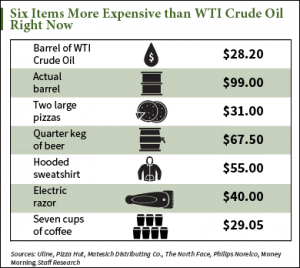 A barrel of WTI crude oil is cheaper than… one hooded sweatshirt from The North Face. The popular outdoor apparel company owned by VF Corp. (NYSE: VFC) sells men's hooded sweatshirts for an average price of $55 – a 95% premium to the cost of WTI crude oil today. A barrel of WTI crude oil is cheaper than… an electric razor. The listing price of one Philips NV (NYSE ADR: PHG) electric shaver is $39.99. That's 41.8% more expensive than the cost of a barrel of WTI crude oil today.